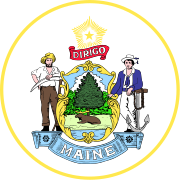 The Maine gubernatorial election of 2002 took place on November 5, 2002. Incumbent Independent Governor Angus King was term limited, and unable to seek re-election. United States Congressman John Baldacci won the Democratic primary uncontested, while former State Representative Peter Cianchette emerged from the Republican primary victorious. Baldacci and Cianchetti squared off in the general election, joined by Jonathan Carter, the Green Party nominee, and independent State Representative John Michael. Ultimately, Baldacci prevailed over Cianchette to win what would be his first of two terms as governor, with Carter taking an unusually high amount of the vote for a third-party candidate. ^ Higgins, A.J. (March 15, 2002). "Farsaci drops out of race after petition drive fails". Bangor Daily News. Retrieved 9 July 2013.